What can replace the drug "Omacor"
The famous Italian dessert won the affection of most fans sweet. To cook it at home is not difficult. The only difficulty might be the ingredient as a real Italian Savoiardi biscuits. Tiramisu is the popular Italian dessert. The history of the cupcake begins in the XVII century. Then, a tiramisu was prepared in a soup. Later it turned into a delightful dessert with a unique taste. Translated from Italian, the name of the cake sounds like "raise me up". This is due to its ease and lightness. Also the soft taste of coffee and chocolate produces an invigorating effect. To prepare cupcake, must be used products such as mascarpone cheese, Savoiardi biscuits and Marsala wine. What differs from the usual Savoiardi cookies? Savoiardi is a necessary ingredient cupcake tiramisu. This is a biscuit a biscuit elongated shape. The top cookies are sprinkled with sugar grains. Due to the structure of cookies is very absorbs the liquid and becomes tender and soft. How to replace the Savoiardi? To buy such cookies in any store will not work. The likelihood that you will find this cookie is very small. But, instead of a long search, you can try to replace it with another pastry, or make your own. A great replacement for biscuits savoyardy is familiar to all cookies "Ladies fingers". This cookie its structure is similar with the Savoiardi biscuits, but it is preparing dough. When cooking cupcake Tiramisu will have to spend a little more effort for impregnation of cookies. 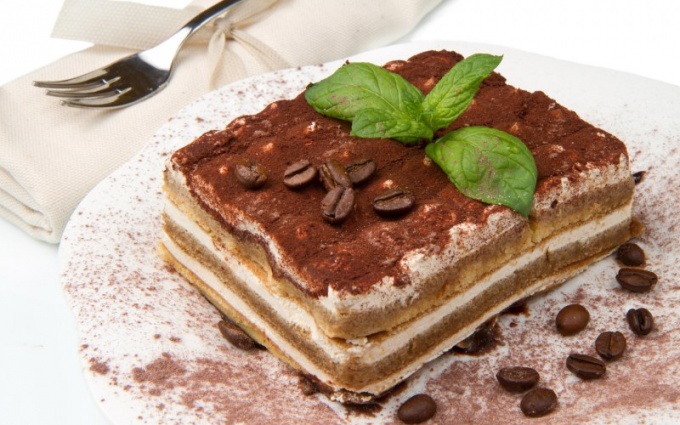 But if you still want to try the real taste of tiramisu, Savoiardi, you can prepare yourself. For cooking authentic Italian cookies you will need: 3 eggs, 100g brown sugar, 70g carefully sifted flour, 40 g of powdered sugar, salt, butter, margarine. The first step to cooking is warming up the oven until 180º. Then, you need to separate the yolks from the whites. First, use the yolks. Take 3 egg yolks and 70g of sugar. Mix them, and then beat with a mixer to form a foam. After the foam, add the flour. Now it's time to work with protein. The protein of 3 eggs beat until foam appears, then, you must link the resulting mass. Next, grease the pan with margarine and lightly sprinkle with flour. Then, using a pastry syringe, extruded on a sheet of sticks with a length of about 10 cm For convenience, you can bake the cookies one whole layer, and after cooking cut into equal sticks. Before sending the cookies in the oven you should sprinkle it with half the mixture of 40g of powder and 30g of sugar. And the remainder to pour out after 10 minutes. Delicious Golden cookies say about his readiness.